This week has been incredibly inspiring. I had the great honor of giving the opening address to the World Congress of Families Regional Conference in Belgrade, Serbia. It was a phenomenal event, with hundreds of people in attendance. The prior day, we addressed the national media from the Republic of Serbia's House of National Assembly. The Serbian constitution explicitly states that marriage is between one man and one woman. However, there are some reasonable nondiscrimination and even hate crime laws that protect LGBT citizens. Gay men and women can serve openly in the military. However, the Serbian citizenry is extremely anti-gay. This coincides with their Christian Orthodox religious adherence. We are co-sponsoring a protest event on Friday at noon at the Mexican Embassy in Washington, DC. If you can make it to DC this Friday, or have friends or family members in the area, we encourage you to join the protest. We have joined with CitizenGO to launch an international petition to let the people of Mexico know that thousands of people across the globe are standing with them in support of marriage, the truth of gender and parental rights. If you haven't already, please sign our petition today. 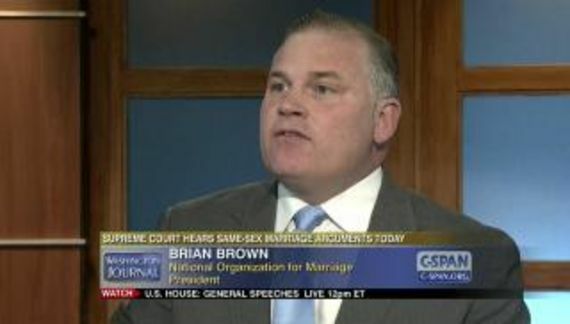 Brown is on the board of CitizenGO. I suspect that it is an Opus Dei organization.